Sisters in Christ - A special time for women of the Rock to worship, pray, study the Word of God, share testimonies and enjoy fellowship in a small group setting in order to gain spiritual and practical guidance for everyday living. We meet every Wednesday from September 14th - November 16th in room 232 from 6:30-8:30 p.m. and finishing with a potluck on May 11th. Please note that the building is air conditioned so you may want to bring a sweater or ja cket. Feel free to invite a friend. Sisters In Christ includes worship, bible studies, testimonies or ministry speakers, classes (both spiritual and practical) and fellowship every week. This session Karen Stevens will be teaching on "From Overcome to Overcomer". Key verse: 1John 5:4-5 "for everyone born of God overcomes the world. This is the victory that has overcome the world, even our faith. Who is it that overcomes the world? Only he who believes that Jesus is the Son of God." Beauty by the Book led by Debbi Butler You won't find these beauty secrets in the latest issue of Vogue, and you can't buy them at the cosmetics counter either. Discover the do's and dont's of Biblical beauty in this practical, female-friendly study from the Proverbs. Find out how you can become a beautiful woman at any age! A workbook is needed for the class and can be purchased at www.priorityministries.org for $11.99. A Passage Through Grief led by Janet Larson A passage through grief offers healing opportunities for various forms of loss, whether it's death, divorce, break-up, abortion, etc., through journaling. There is a book for this class, $10.00. The Heart of the Artist -- equipping us to be God-glorifying worship team members and leaders led by Ashley Collins This class is especially for those interested in serving in worship ministries, but is open to anyone interested in leadership who wants to learn valuable principles of an excellent leader. The book cost for the class is $16.99. Empowered to Love The Unlovable led by Kirsten Strawn Are you willing to die to have the most amazing life ever? Not a physical death, but dying to your old ways to experience true love. Perhap s you're ready to throw in the towel on your marriage, kick a defiant teenager out of the house, or leave your job due to a difficult co-worker. Have you done everything in your power to love that person who seems to know how to push all your buttons? Do you feel abused, betrayed, deceived, or used? If you're shouting, "No more!" then it's time to stop the old way of doing things and try something new. For a moment, examine your thoughts. If frustration has turned to hatred, which has turned to hopelessness and despair then the enemy is seeking to decieve, destroy, and distract you from God. These thoughts and feelings are common. Jesus spoke of them, we all struggle with anger and "what ifs" and thinking like would be better if that person was out of your life. But consider that the difficult person in your life is there for a purpose. There's a reson why you work where you do, why that person irritates you, why you married who you did, or why your child isi actinf out and being disrespectful. Just maybe God wants to use that person in your life to give you an abundant life. Come learn nine biblical principles to be EMPOWERED to love the unlovable. No book required. Replace rationalization that leads to diet failure with wisdom that leads to victory. Reach your healthy goals and growÂ closer to God through the process. Materials: You will need the Made to Crave book by Lysa Tekeurst and is available in Rockpile Bookstore for $14.99. 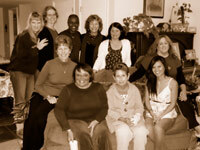 If you would like to donate to women's ministry click here. We look forward to being with you soon!